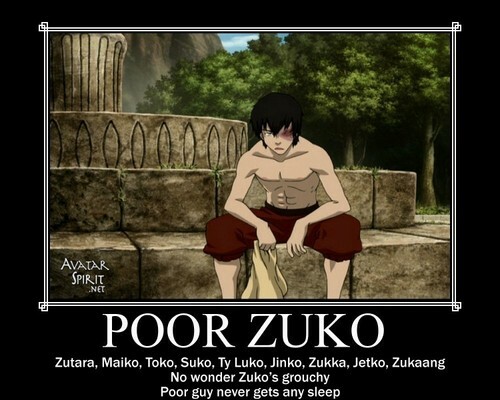 Poor Zuko Motivational. i think i got them all. HD Wallpaper and background images in the アバター 伝説の少年アン club tagged: avatar the last airbender zuko humor motivational. This アバター 伝説の少年アン fan art might contain 看板, ポスター, テキスト, 黒板, サイン, 肖像画, ヘッドショット, クローズアップ, ポートレート, ヘッド ショット, and クローズ アップ. i get all the other ones but whats "Jinko"? all I have to say is get some sleep! never knew zuko could fit into so much ships. no wonder he always looks grouchy. lol. Toko's my favorite. Mainly because I Zutaang, hated maiko and wanted toph to be with a main character that wasn't sokka. WHY DID I WRITE ZUTAANG?????? It's KATAANG NOT ZUTAANG! GROOSSSSSSS. I was MEANT to write I like Kataang dunno WHY I said Zutaang. eww. What do you get when you get a bunch of bored fans? A million Avatar shippings, that's what.